There will always come a time when superheroes question themselves and become vulnerable and look back to the roots of their mere existence - being a human and experience mankind. This is what exactly how (in my perspective) the story of the movie "The Wolverine" went. But this plot was really nothing new because, like I said, all superheroes experience this kind of dilemma. If I may give some examples to this, then Tony Stark or Iron Man in "Iron Man 3" is really the best example. Citing an example to our Philippine superheroes, "Darna" (the TV series) which starred Angel Locsin, also at one point experienced questioning herself and became vulnerable. At this point, the TV series heroine's plot has not yet evolved. Whether or not Angel Locsin's Darna story plot will continue to where it ended (the ending was a bit open-ended where Narda aka Darna threw her magical white stone into a river and forget about her duties and responsibilities as a superhero) or not. But of course, that is another story. Going back to the movie "The Wolverine," well, the movie really started slow. The pacing of the story is not dragging but helpful, but it is also slow. This is the time where Logan (Hugh Jackman) is experiencing nightmares of the past when he was a captured prisoner during the World War II in Japan, and of the events that happened after the X-Men 3: The Last Stand when Jean Grey died because of him. The emerging of another "Wolverine" movie may have confused moviegoers because of the previously shown X-Men Origins: Wolverine, but the team behind "The Wolverine" movie assured us that this movie is NOT a sequel to second X-Men Origins movie franchise. Though I would be happy if this is the sequel to the X-Men Origins movie, that is to NOT to confuse people on what's happening and what's going on inside the Marvel Universe. Anyway, moving on. What I really like about the movie is that it focused only on Logan and him being the Wolverine - his personal struggles as a person and as superhero, his desires, and perhaps his compassion as a human being. Yes, the Wolverine has feelings too! Behind his beefy physique and towering built, Logan is also a weak person inside (that is before and after the Viper has planted something on him... oooppppsss... spoiler! Hahaha!). The Wolverine movie shows a different side of being a superhero - that superhero also gets tired, wounded, and most especially, fell in love. Although I am not saying that falling in love is a sign of weakness, the movie showed that love can be a source of strength, too. Just imagine Logan being a lover boy is really beyond my expectations in this movie. Simply love it. I guess comic book fans should not really rely on what's going on in the Marvel Universe's movie versions because comic books and movies are really two different genres. I'm sure a lot of comic book fans are on their raging hormones right now the moment they saw this film. That is not really a spoiler but a bit of a warning I guess. Hahaha. Anyway, another point in the movie that I love is that I was not overwhelmed with superheroes and super villains alike. The Wolverine only has one archenemy in this movie - Viper. However, the appearance of Silver Samurai is really predictable, but the action scenes are superb and jam-packed with adamantium awesomeness at its finest! What really surprised me was Yukio. I never thought she was an ally because the movie trailer of "The Wolverine" doesn't tell it so. Director James Mangold may have this idea that he created in his mind where he would take Logan as disturbed, weakly person, in a bodybuilder's suit. The director has touched the story in a more human way that in a supernatural being. Again, I simply love it. Overall, the movie "The Wolverine" is one movie experience you should not miss. If you really are a fan, then just don't take my words for it... go ahead and watch the film! 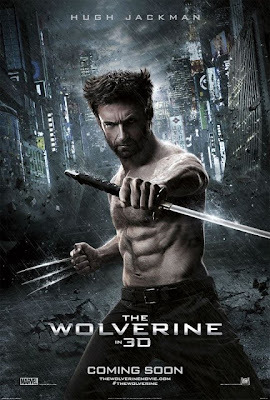 "The Wolverine" is still showing in movie theaters, nationwide! Available in 2D and 3D formats!